Enjoy the benefits of raised garden beds. 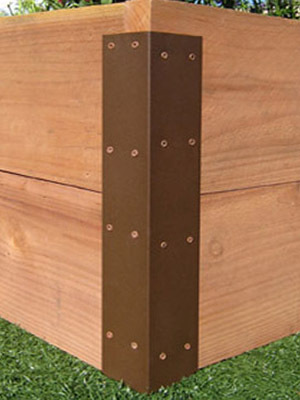 Corner brackets make it easy to put together sturdy and straight garden beds. They're attractive and help simplify the assembly of planter boxes. 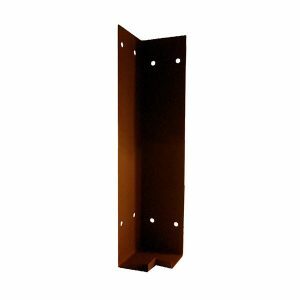 We offer both 20″ and 12″ Corner Brackets to suit your garden's needs. 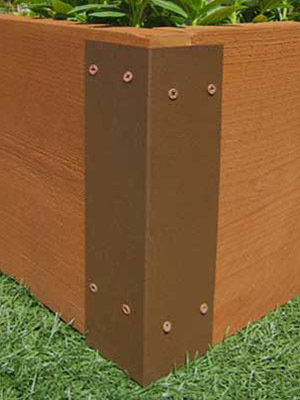 We manufacture attractive sturdy brackets to simplify the assembly of planter boxes. Our brackets are designed to fit standard 2″ wide rough lumber boards. They are available for 12″ or 20″ high beds. The corner brackets make it easy to put together sturdy, straight beds. Our brackets are made of powder-coated, 18 gauge steel and come with matching screws. They may be used to make a variety of garden bed shapes to suit your yard. The most popular designs are rectangular, L-shape or U-shape gardens. Use your imagination…the possibilities are endless! To build 20" high beds, you may stack either two 2"x10" boards on top of one another or stack one 2"x12" and one 2"x8" board on top of one another. Stand up the corner bracket. Using 2"x12" rough lumber or 2"x10" rough lumber, slide the two pieces of lumber together into the channels of the bracket. For a snug fit, make sure the lumber is cut straight at 90 degree angles. Insert the upper boards and secure to the brackets in the manner described above. Unique lumber channels inside the bracket hold lumber upright for easy assembly.